The 2013 Cross-Strait Service Trade Agreement aims to open up investment from China and Taiwan in industries such as banking, healthcare and tourism and is seen by many Taiwanese citizens as an increase in China’s economic and political control over the island. Since protests against the agreement spread out in 2013, the situation has stalled, and China’s commerce minister is now urging Taiwan to ratify the pact in the interest of both sides. China's commerce minister on Tuesday urged Taiwan to ratify a controversial trade pact that has languished in the island's parliament after protests over trade dealings with Beijing. 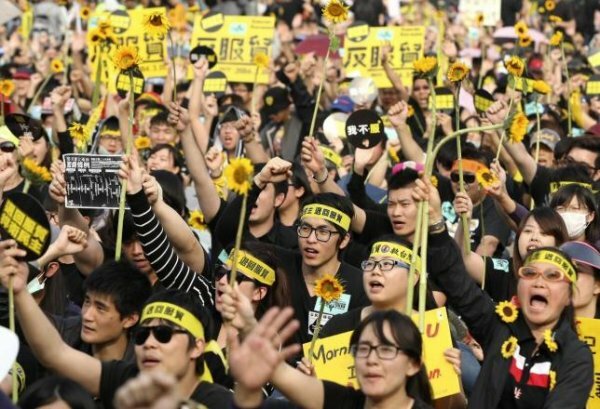 In 2014, hundreds of students occupied Taiwan's parliament for weeks in protests nicknamed the Sunflower Movement, demanding more transparency and fearful of China's growing economic and political influence on the democratic island. The deal has since stalled in Taiwan's parliament, though the manner in which the self-ruled island moves forward in the current February to May session will be seen as a sign of how President-elect Tsai Ing-wen will steer Taiwan-China ties. China's Commerce Minister Gao Hucheng warned that the deal could go to waste. "I hope the Taiwan side can preserve and safeguard the political foundation and correct orientation of the peaceful development of bilateral relations, urge that the Cross-Strait Service Trade Agreement be put into effect as soon as possible, and promptly allow the people and enterprises on both sides to benefit," Gao told a press briefing. "Otherwise, even despite good preparation, the efforts will amount to nothing," he said. China, including Hong Kong, is Taiwan's top trading partner, with a total of just over $170 billion in 2014, official data from Taiwan shows. About 40 percent of Taiwan's exports, such as tech components and chemicals, go to China. China has claimed Taiwan through its "one China" policy since the Chinese civil war forced the defeated Nationalist forces to flee to the island in 1949, and Beijing has vowed to bring it under its rule, by force if necessary. Tsai, leader of the independence-leaning Democratic Progressive Party (DPP), won the Taiwan election in January, but has vowed to preserve the status quo with "consistent, predictable and sustainable" relations with China. The DPP also won a majority in parliament in the same elections. The DPP and the Nationalist party could reach an agreement to ratify the trade deal this year, should the Cross-Strait Oversight Bill be passed by Taiwan lawmakers first.